Hands up if you like a cup of coffee to wake you up in the morning? How about a coffee body scrub? Well, have you ever thought about including coffee in your skincare regime? 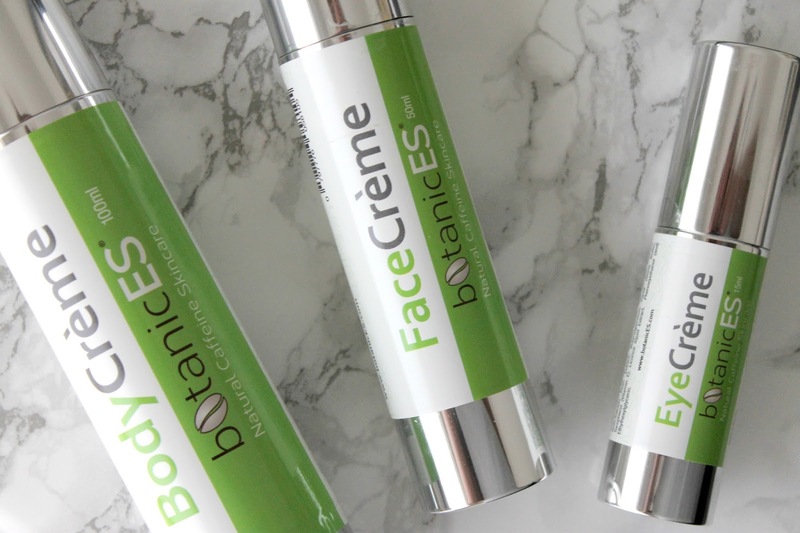 The BotanicES natural caffeine skincare range claims to rejuvenate, hydrate and balance your skin in an environmentally sustainable way. Their gentle creams contain natural caffeine which provide a rich source of anti-oxidant properties for tighter, firmer skin with a supple complexion. Caffeine is known for making the skin appear tighter and firmer with a supple complexion. 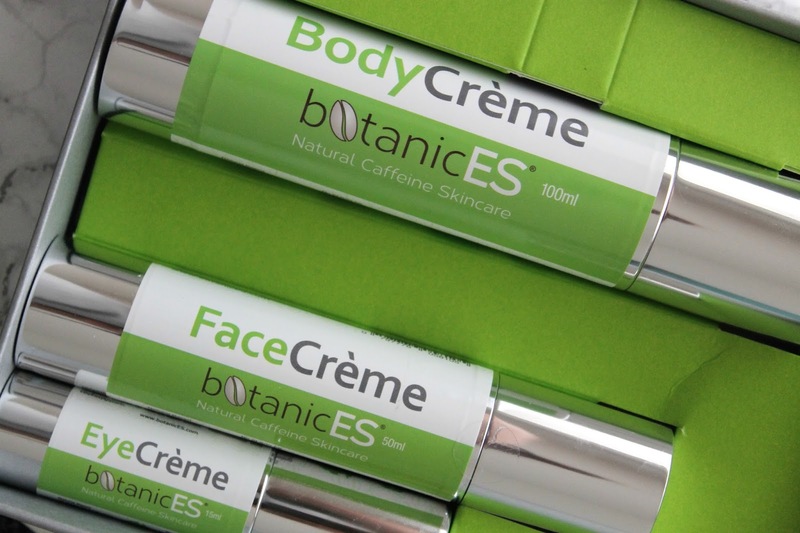 Their natural based Body Moisturiser*, Face Moisturiser* and Eye Serum* uses natural caffeine to energise and revitalise the appearance of the skin. Rapidly absorbed for essential hydration, natural Caffeine, Jojoba and Coconut Oils, together with Vitamin E, help promote elasticity and bring optimal moisture to the skin, making it feel younger, firmer and fresher. The natural based Eye Serum* is quite cool and refreshing and it supposed to help with puffiness and fine lines around the eyes. When using this, I definitely noticed a difference in the reduction of my under-eye bags and I felt like it really took away that dull, tired look from around my eyes. I wasn't too huge of a fan of the Face Moisturiser* as my oily skin did not agree with this at all! I think I'll be passing this off to a friend. The Body Moisturiser* was probably my favourite out of the trio, I loved using this all over my body but especially on my arms and legs when first stepping out of the shower. The trick to working this into your skin, is to massage it in until your skin has dried and it has absorbed all the product. Mine soaked up quite quickly, though I'm not sure whether that's a good or bad thing! I think this little trio set would be a beautiful gift for Christmas for the beauty lover who has everything. I mean, who doesn't like to pamper themselves every once in a while? Have you ever tried skincare containing Caffeine? Did you notice any differences it made to your skin? The only thing that I've used with caffeine is Garnier eye roll on BB cream or a name similar as that. LOL! I do like it though but you definitely got me intrigued with this line. Do you know if they ship worldwide? Ooh, I used to love that eye roller ball! Not too sure Shireen, definitely check out their website! The Eye Serum sounds very impressive - I like the packaging too! A lot of products that receive glowing reviews these days seem to contain caffeine of some sort :) Hope you're well Anjelique! It is super cute packaging, I love how it's all bundled together too! I have used only a natural coffee scrub where I take used up coffee powder add a bit of oil and use as a foot scrub. The coffee skin care range sounds quite amazing. Ooh, I do love a good coffee scrub all over to wake me up in the morning! Seems great as caffeine gives amazing result. Yes, it is very interesting! Thanks Harija! Happy Thanksgiving to you too! Aw I've never tried something with Caffeine. But I know more about it benefits! thanks for sharing those products, something new and interesting to me! No worries, I hope you get to try something similar! I don't think I've used any skincare product with caffeine in it. I would really like to try that eye serum, I hate early mornings so does my eye area! Haha Oh, I feel you! I need this to help perk my eyes up!